Lace wig care (and caring for all other types of human hair wigs) is key to making sure that your hairpiece looks good and lasts. It may be a human hair wig but it's still human hair and needs to be cared for in the same way (if you have a synthetic wig, there's a guide about how to care for synthetic wigs). It’s important to remember that only "raw hair" wigs where the entire wig is made from completely unprocessed hair from one single donor (the majority of wig hair textures are achieved from chemical processing to create waves, curls and straight textures) are the longest lasting type of wig. Remy hair will have undergone processing to achieve texture and colour (the majority of human hair used by wig makers is from naturally straight hair sources). Due to the processing of the hair for Remy hair wigs, it’s important to treat your wig well. It’s a little known fact but leave-in conditioners actually dry out the hair and make it brittle (as the protein contained in the conditioner absorbs the moisture from the hair). So as part of your wig care routine it's important to to ensure that the hair on your wig is nourished, use vegetable or nut oils (like argan oil, coconut oil and almond oil) or a glycerine and water mix (at a rate of 10% glycerine and 90% water) on a daily basis - a light misting is fine, or smoothing frizz and dry ends. Using an oil that's absorbed by hair to seal in moisture after conditioning also nourishes the hair by keeping hair hydrated and smoothing the cuticle so that the hair is kept soft and supple. Heat damage is a particular risk with curly hair wigs and there's an all in one care guide for curly hair wigs. If you have lighter coloured hair on your lace cap wig or traditional cap wig, it's likely that it will have been dyed (lifted) to this colour using ammonia (unless the hair is from a European source). Due to this, it's better to refrain from using heat styling tools (including high heat settings on hair dryers); however if you feel that you simply couldn't get by without the odd heated roller, straightener or curling wand then using a thermal protection spray or serum will help reduce any heat damage. Detangle hair prior to washing and to avoid tangling during the washing process (which can lead to shedding), it’s best to wash curly lace wigs and hair extensions in the way described here, using Styrofoam (polystyrene) head as this gives you greater control of washing process and reduces the likelihood of tangling; which is essential for maintaining your monofilament or lace wig. If you have a long (18" or more), straight textured lace wig, you can use the method above; or if you have a shorter (16" or less) straight wig, your can head for the sink method sink method for washing lace wigs and hair extensions. Deep conditioning the hair helps to repair and strengthen the hair and you can use a deep conditioner and apply heat to allow the protein to penetrate the hair and ensure that it remains as healthy as possible and leave to air dry - once or twice a month should be fine. Use a low heat setting for heat styling. Use a wide tooth comb instead of a brush to avoid pulling at the hair (this is good practice even for straight textures). Deep condition human hair wigs at least twice a month. 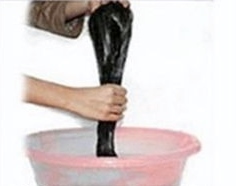 Use gentle washing methods for your wig. Keep the hair moisturised daily with oil free sprays or moisturisers without mineral oils (look for moisturisers with plant-derived oils instead). By treating the wig like this you’ll be able maintain the lustre and look of your lace cap wig or monofilament cap wig. It may seem like a lot to take in, but once you’ve had your wig for a while, washed and styled it a few times, it’ll become second nature to you and easy to do. Maybe you only wear lace wigs, but maybe you wear other hair too. So if you'd like to know about how to care for hair weaves then you can check out the Caring for Weave Hair Guide or if you're more into micro ring hair extensions (aka micro bead hair extensions or micro loop hair extensions) then why not see our Hair Extension Q&A section for micro ring hair extension care tips and guides. Speaking of guides.... There's more information in the Lace Wig Q&A section, or you can keep up to date with all our guides and articles about hair extensions, wigs, weaves and hairpieces by joining our blog, it's easy to do and doesn't require any personal info - yay!